Bangkok offers a wealth of experiences for all travellers to this fascinating city, from haggling in the busy street markets to designer shopping and fascinating cultural tours of the many temples and floating market. As we were there for 2 days we only had chance to sample a very small selection of what is on offer. After checking into our hotel on the first evening we ventured out to ‘Patpong Night Market’. The market is a hustle and bustle of 1000’s of stalls selling copies of designer watches, clothes, shoes, bags and much more. Always haggle for the best prices, I would advise offering at least 50% lower than the asking price with a view to meeting in the middle. One thing to bear in mind with this market is that it does border the ‘red light area’ and you will be approached by bar staff trying to entice you into the many ‘clubs’. Good location on the city side of the river, within walking distance of the skytrain & underground. 25 floors with 251 rooms & suites offering a good, clean, modern standard of accommodation with a contemporary feel. There is even a small pool and some spa facilities. The food is excellent and there are a choice of 2 restaurants, with 24-hour room service and wireless Internet in all rooms. A well laid out resort with 413 rooms over 4 floors. This hotel is located on the opposite side of the river to where the main attractions are and is either 40 minutes in a taxi or 20 minutes across the river to the skytrain station and then on from there. This hotel would not be ideal if you wish to take many trips into the city centre or just wanted to venture out on foot in the evening. What it does have is a high standard of accommodation with spacious rooms and one of the largest outdoor swimming pools in the city. 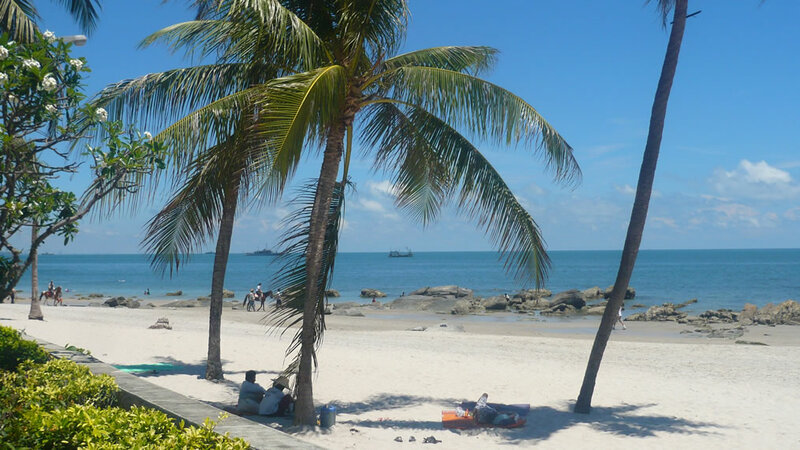 Great for families who want to experience Bangkok through organised excursions and who also want some rest & relaxation before transiting on to a beach destination. The hotel has 6 restaurants and is close to mainstream shops and fast food restaurants. The first high rise hotel to be built in Bangkok, with a reputation for excellence. The Dusit has hosted many famous people in the past including the Thai Royal family. Rooms are clean and spacious and for those who want something extra special there are several Thai themed suites that offer panoramic views across the city, even whilst sitting in the luxurious roll top bath. Club rooms offer the added bonus of a private lounge, where snacks and drinks are served throughout the day and during ‘Happy Hour’ 05.30pm to 07.30pm all drinks including cocktails are free. The location of the Dusit could not be better, 2 minutes walk from the skytrain and just 2 stops to Siam Square, both night markets are within walking distance and there are many good restaurants both in the hotel and outside. The river is the lifeblood of Bangkok and no one should leave without taking a trip- a fabulous way to see the sites. The Sheraton is in a fabulous position on the city side of the river directly on the riverbank; all rooms have a river view and the higher the floor the better the view. There is a lovely bar and restaurant that is situated on the river bank within the hotel grounds, the food is great but again prices are more expensive than restaurants in town. The downside of the Sheraton is that unlike the Dusit you either have to take a ferry and then the skytrain to get into the city centre or a taxi. Taxis are cheap at around £2 one way from the hotel to Patpong but in the day traffic is a problem so best to use the Taxis outside of rush hour. If you arrive in the afternoon or early evening be aware that trips to the ‘Floating Market and the ‘River Kwai’ leave at approx 6am in the morning as the transfer time is approx 2 hours, so you may not wish to do this after a long flight the day before. Getting around is really easy as long as you avoid the roads! Take the skytrain wherever possible. The river gives easy access to most destinations or to the skytrain stations that will take you into the city centre markets and Siam. Taxis are cheap but always ask for a meter or agree a fare up front. Hotel prices can be steep for food & drinks, wine is particularly expensive as the government tax is around 300%, a glass can cost around £5. Visit the ‘Vertigo restaurant’ or ‘Moon bar’ on the rooftop of the 61 storeys ‘Banyan Tree’ Hotel. Other great restaurants within walking distance of the Dusit Thani Hotel are ‘The Mango Tree’ and the more contemporary ‘Eat Me’, both serves authentic Thai cuisine.